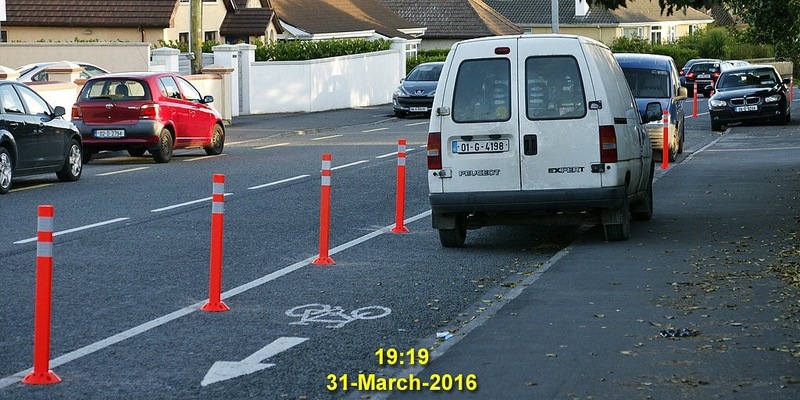 Bollards installed this week to protect a cycle lane outside a Galway City school from illegal parking were described as a “valiant effort”, but it seems it might already be a failed effort as motorists yesterday drove around the bollards to park on the cycle lane. Galway City Council installed the bollards on Threadneedle Road this week as schools are on their Easter holiday — so the bollards might yet prove effective at restraining school run traffic. Galway-based sustainable transport group, Cosain, told this site on Wednesday that they were giving the bollards a “cautious welcome” but yesterday they contacted us with images of two vans and a car which just mounted the footpath to get around the bollards. A ‘bualadh bos’ for Galway County Council on this initiative but it certainly needs the support of the Garda. It will be watched with interest! Also it would be interesting to know if the school in question has a Green Flag for transport!? This is indeed a valiant effort by GCC. Let’s hope it works and is supported by the Gardai. We could do with a whole load more of these types of initiatives. Threadneedle Road hosts St Endas and Salerno Secondary Schools. Salerno is a girls school that historically had a strong cycling culture. The first problem with this scheme is that it is in the wrong place. If you can get to Threadneedle Road by bike – then you have already won the jackpot. It is the approach roads that many children must use to get to here that are the main problem. Kingston Road for example is extremely cyclist-hostile but nothing was done. Like wise children coming from the north must deal with a large roundabout at Fort Lorenzo followed by a stretch of road that is blocked with queuing cars at school travel times. This was a more “shovel-ready” location for a cycle lane since there is no demand for parking but nothing was done. Even if these bollards have the desired effect, these issues will still remain unresolved. These issues were also pointed out several years ago when this scheme was first proposed by Dublin-based consultants. Surely not rocket science to ensure bollard protected areas are not accessible to vehicles? I see from updates on Cosain’s twitter-feed that the bollards end at a stretch where there are driveways to peoples houses. Obviously you don’t want to, and can’t, block access to driveways with bollards, so I can understand the decision not to continue the bollards all the way up the cycle path. However, this then comes down to proper enforcement by the Gardai. 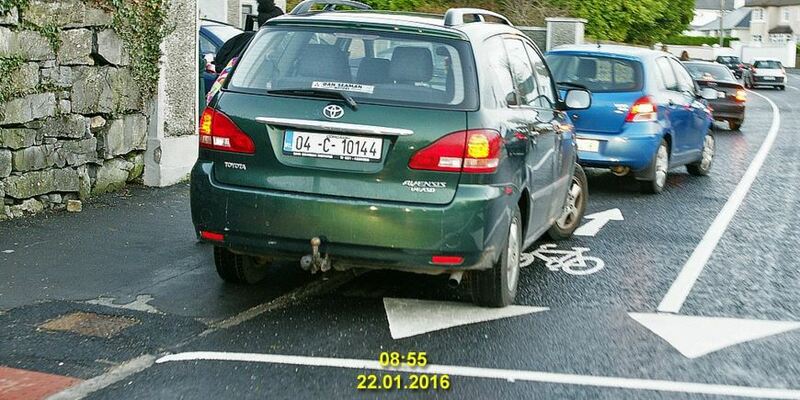 As evidenced by Cosain’s photos, the car-drivers in that part of Galway don’t give a rats-arse for the presence of the cycle way and will stop and park on it whenever they feel like it. How did they develop that attitude?………. Because there’s clearly zero, or close to zero, enforcement of the rules. This is the same the country over. #freethecycelanes is full of such examples. And not just occasional fly-parking where the Gards may not get to see the offence, but consistent and repeat offences, often by the same individuals in the same locations at the same times. This should be like shooting fish in a barrel for the Gards, but yet for the most part they stand idly by. Why? In my own town of Raheny, an unofficial taxi-rank is regularly in play on a mandatory cycle-lane (and also blocking a corner). Directly across the road residents who live beside the mandatory cycle lane simply park their cars in it all the time. In yet another mandatory cycle lane shoppers who drive, completely block the lane with their parked cars. All this happens within 2 minutes walk of Raheny Garda station. Honestly, I don’t get it, what’s the reasoning behind the Gards decision to allow this to happen? What Cosains photos did not show are the 8 school coaches that are now forced to park a little further down the road, outside of the Tennis Club. This road is, and always has been, a mess at school opening and closing times. The gardai have no interest in any form of parking enforcement and people know this. I was told that some discussion is on going with schools managements about having these coaches park inside St Endas, which has significant space in their grounds to allow for safe loading. Thus leaving the road free for cyclists and passing traffic. So the Gards the country over are failing to meet their statutory requirements ie uphold the law in relation to illegal car parking. Should there be an inquiry into why this is? Should these powers be taken away from them? Should these powers be passed on to another body of the state? I don’t know, I’m just raising the question for discussion. derricktaxi59 is correct: bus and car parking has been displaced. The buses are now further down Threadneedle Road, along with some cars. There is chaos and congestion every day. No Council or Garda presence. Indeed Gardai often drive by, ignoring the traffic and parking. Some drivers have now taken to parking in neighbouring estates, eg Carraig Ard, and wait there for their offspring to walk up from school. It’s doubtful that the 350 mtr cycleway (75% now with bollards) is leading to an increase in active travel to school. As pointed out by Shane Foran above, the bigger problem is the cycle (and pedestrian) hostile nature of the main approach roads, roundabouts and junctions. The Western Distributor Road is dire, and the Kingston Road is downright dangerous. So their thinking is that reducing the need for people to drive (by increasing public transport & cycling) will cause an increase in private car congestion…. ??? That sounds a bit bizarre.